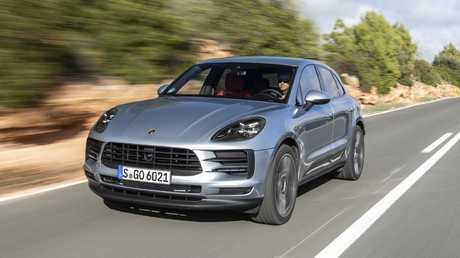 PORSCHE'S top-selling Macan SUV has come in for a midlife facelift, which - not surprisingly given that it's been a runaway success since 2014 - is less about the revamped style and more to do with revised powertrains. 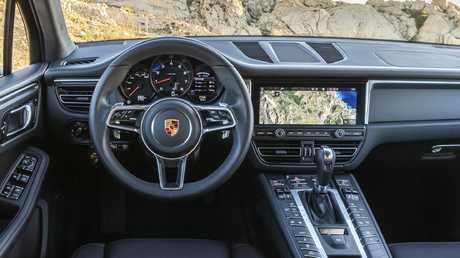 While it now incorporates LED headlights with the four-point daytime running lights from the 911 as standard, a larger central air intake with side air inlets and new 20 and 21-inch wheel options, the major mods lie underneath with the choice of a four-cylinder or V6 turbo petrol engine. The Porsche Macan is the company’s best selling vehicle. Forget diesels as they're no longer part of the Porsche picture. The base Macan with 2.0-litre turbo four and sports Chrono package gets to 100km/h in 6.5 seconds on its way to a 225km/h top speed. It's a lively little job that makes exceptional use of the seven-speed PDK transmission and will fit the bill for most of us. I couldn't help feel a bit deflated looking at that historic Porsche crest on the same sports steering wheel used on the 911 and 918, only to hear an albeit inoffensive, four-pot singing under the hood. Be thankful for small mercies - the $81,400 four-cylinder bound for Australia gets a bonus 5kW denied its Euro cousins, thanks to a fuel particulate filter not being required here. 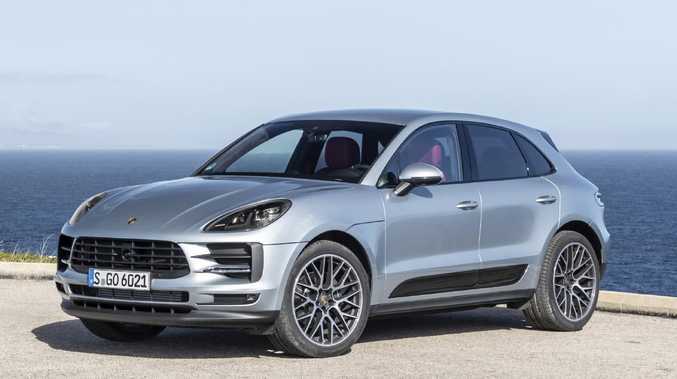 If you think the four won't cut it for bragging rights, there's the $97,500 Macan S. Its 3.0-litre, twin-turbo V6 sounds suitably feisty when you bury the loud pedal. It powers from rest to 100km/h in 5.1 seconds with the sports Chrono package and, if you get the chance, on to 254km/h. The base four-cylinder version gets extra power in Australia. 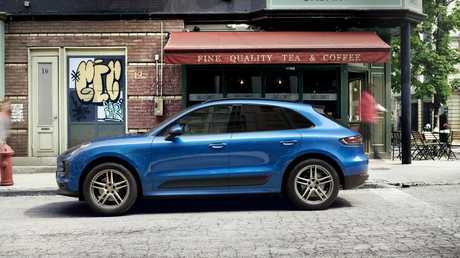 Coming later are the Macan Turbo and the GTS that will no doubt appeal to the traditionalists. Assessed rationally rather than emotionally, each engine is exceptionally capable. Taking that approach on the narrow lanes of Majorca during the launch program, I preferred driving the four-cylinder for its lighter nose. Thanks to the use of lighter alloys in the front suspension and revised spring rates, it had more feel through the steering and less bump-thump compared to the old model. On wide, open Australian outback highways, however, you would pick the completely new V6 with its centrally mounted turbos as a more capable trans-city tourer. Regardless, both improved on the steering, ride and handling of the outgoing Macan. Rear styling adopts the Porsche family 3D-style, full-width LED tail-lights as well as four-point brake lights and diffuser. The Macan sports Porsche’s classic styling. 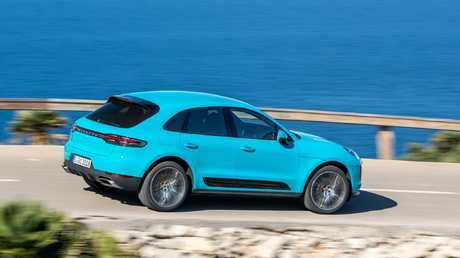 Standing out even more than its predecessor, the Macan comes such wild colours as Miami Blue, Mamba Green and Crayon Grey alongside the staples of silver and white. Inside there's the heated, multifunction GT sports wheel with mode switches for the Chrono package, new central air vents (which thankfully aren't like the overly complicated, electric jobs in the Panamera), Apple CarPlay and Porsche's communication set-up with 10.9-inch touchscreen and online navigation. Apple CarPlay is accessible through a 10.9-inch touchscreen. The cabin is largely unchanged but there is a host of much-needed assistance and connectivity tech, including rear park assist with reverse camera and surround view, lane change assist, lane keep assist and traffic jam assist including adaptive cruise control. 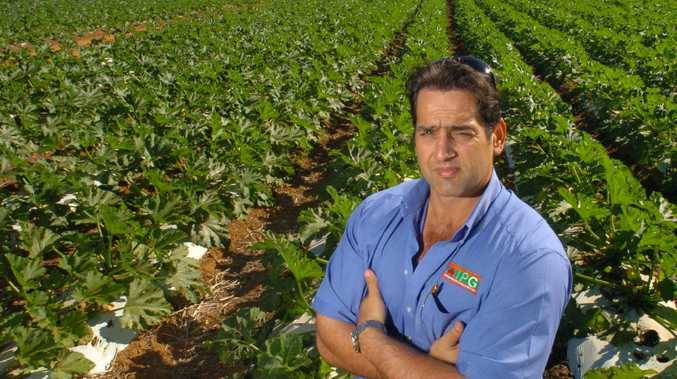 The more sophisticated Voice Pilot does a better job with the Australian accent than previously. The Porsche Connect app has a finder function using Google Search and Risk Radar which looks ahead and notifies of incidents, crashes or fog. 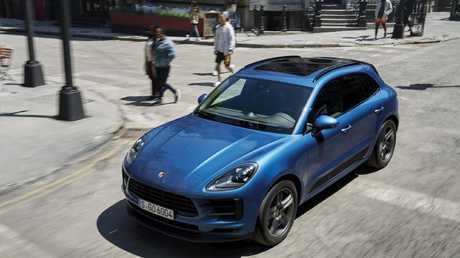 Departing from the longstanding Porsche focus on performance and exclusivity, the Macan's brief is about comfort, convenience and connectivity - it works, as it has been the brand's most successful model in attracting new customers. For all the 911's sporty brilliance, the reality is that it's the lowest selling model in the range, representing 10 per cent of Australian deliveries. The Macan remains Porsche's top-selling model globally. The Macan is brand’s most affordable model. At its 2014 launch, the plan was to top 50,000 sales and the tally at the end of year one was just under 45,000 sales - this shot up to 80,000 in its second year and in 10 months the figure reached 68,000. Porsche predicts it will sell 400,000 vehicles this year. The Macan and Macan S are due in Australian showrooms in February.